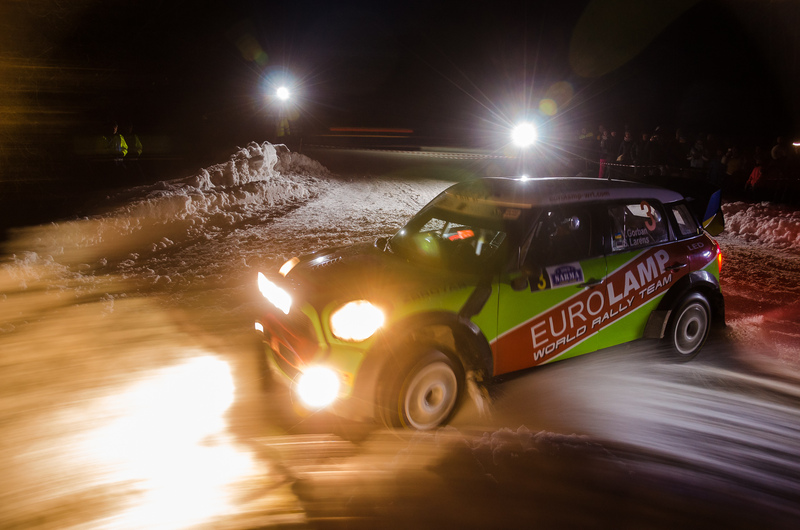 Eurolamp World Rally Team took part in Rally Sarma – the second stage of Latvian and Estonian rally championships. 71 crews gathered to start the race for the 44th time. The Ukrainian-Estonian duo was considered to be one of the favorites even before the race start. Upon finishing the first special stage, Mini JCW WRC painted in green and red appeared on the second place of general classification. Its struggle for seconds was stopped by sudden driving off the track. Loss of fifteen minutes pushed the crew far beyond the top ten in the final standing. “We stuck in a snowdrift right before the last turn, where there were no spectators and we dug ourselves out for a long time. We had to jack up the car, look for logs, put them under the wheels, and, therefore, we had no chance to win the race. After that we just enjoyed ourselves driving,” summarized Valery Gorban after the finish. In the mid-distance, the crew put a mark in the special stage win column. For the current champions of Latvia and Estonia, it was a small solace. Estonian and Latvian Championships take a break until May, when their paths will diverge. The race in the vicinity of Tallinn will break the “rally silence”.